The CD was Rob Fitzgerald and the competition was flown on the superb grass surface at Alexandra Park. It was great to see experienced pilots and pitmen alike without their ‘race faces’ on. Everyone seemed intent on having a good time. And indeed they did. We did run out of time to run a 200 lap final, so results were decided on best heat times. And these were OH SO CLOSE! For example Thommo and Steve missed out on the top three by a mere 69/100th of a second. And Bruce and Kerry were only 34/100th of a second behind them! An attraction of this speed limited racing is the amazing variety of engines used. There were R250’s, Nelsons, Rossis, PAWs. Foras and probably a few others. There are also a large variety of Goodyear designs to build. Let’s face it… we all have our favourites. Just set them up to circulate at a whisker over 27 seconds for 10 laps and you’re in business. Go under 27/10 and you’re pinged! Speed Policeman Andrew Heath was there at the Nats to call any offending team in for an extra pit stop. I’m fairly sure all models flew at or near the correct speed. At the end of the day, it was fitting that Graeme Wilson flew the winning model, ably pitted by Murray. Graeme has put in an enormous effort as overall CD for Control Line at these Nats and it was great to see him rewarded with a win. There is no doubt Class 2 is one of the best racing classes around. Results are always close and certainly this year was no exception… just a scant second between first and second! It was clearly the tightest final of the Nats. Six teams lined up to do battle. Perennial finalists and frequent Class 2 winners Harry Bailey and Mark Ellins were expected to do well with their highly successful Montezuma’s Revenge and Nova Rossi .21. A 2.56.62 heat saw them qualify easily for the final. Harry’s Monty racer was built an astounding 15 years ago and since its first win at the Easter Nats in Waikerie back in ’98, it has seven firsts, two seconds and a third. To that total, you can add a win in Open Rat at the 12/13 Nats. What a marvelous engine that Nova Rossi has been since being set up originally by Robin Heirn. Primary flicker has always been Mark Ellins. Last years winners Murray Wilson and Alan Lumsden had the speed to do a repeat with the powerful Nelson .29. They beat Harry and Mark by less than a second 12 months ago! However, this year the stops were not as fast as the .21 engined models and the best they could manage was two 3.02’s. Fastest heat time and first choice for the final went to John Hallowell and Ric Justic with a 2.53.28, ably assisted by Andy Kerr on battery. Their Rex .21 racer was right on song and ready for the fray. The Macca Racing team of Trent and Mark McDermott showed they were right in the mix with two smart times of 2.57.03 and 2.56.97. The Cosmics have not yet sorted out their special OS.21 car engine, so they chose to fly ‘old reliable’ and were not on the pace needed to make the top three. Shane Leknys and Steve Walton bought a Super Tigre .29 racer from the west but unfortunately did not get to show its potential. Next time! So it was 3 versions of ‘Monty’s Revenge’ and 3 different Nova Rossi .21 engines that were there to contest the final. There was nothing in it on speed with all three models evenly matched. No doubt this race was going to be decided in the pits with all teams needing three stops for the 140 laps. Although it is possible to get 47-50 laps with these engines, it is safer to go for 35-40 laps and run a touch rich. It’s easy to knock out a plug when running a fraction lean, as the Maccas found when they came down for what would have been their last stop to find the plug gone. According to timekeeper Rob Fitzgerald, they were just in the lead but now their race was over and they finished on 109 laps.. 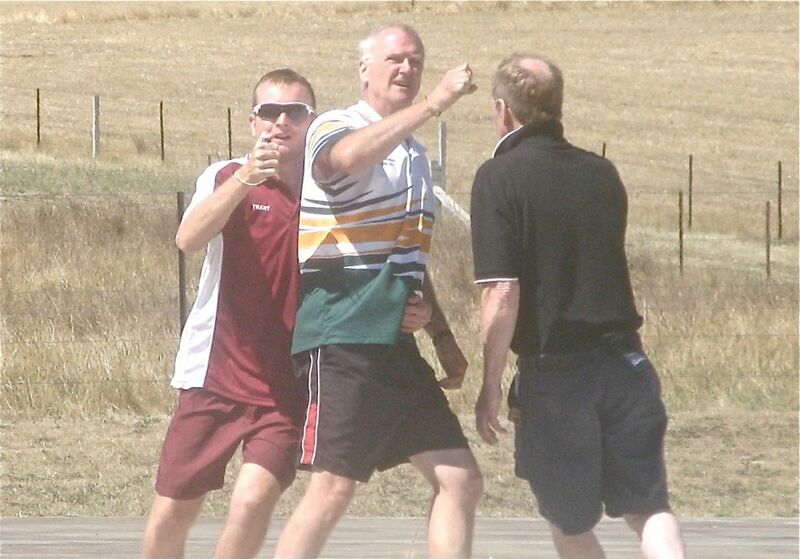 It was left to Harry and John to battle it out in the middle and when Harry’s shutoff was accidently tripped on takeoff, Ric and John thought the race was theirs.. .J However brilliant work in the pits by World Champ Mark just got them across the line first by one second… 6.04.97 against 6.05.91. Well done to Harry and Mark. It really was a fantastic team race and I for one can’t wait to do it all again! Classic B was run at the verdant Alexandra Park, a really great place to fly. We are very fortunate to have such a superb facility available for the Nationals. Seven teams lined up with what was always going to be a close contest. Weather was warm, probably around 30c and the light breeze was perfect for flying. Ric Justic and Paul Stein were surprisingly the only team to dip under 3 minutes for the 70 lap heat. Their 2.55.28 with the modified Rocket and OS FX virtually guaranteed them a spot in the final so they wisely chose to rest themselves and their gear in round two. Jim and Colin Ray were practicing early in a bid to get their Crescendo and OS FX sorted. They went close in round one by posting a 3.07.06. However, the Macca Racing team did a 3.06.34 in the second round to just tip out the Cosmics by less than a second! As always, Classic B racing is super close. Those Maccas are like pepper and salt. They’re in everything and usually end up in the pointy end. The Ray Harvey built Dalesman had good speed and sharp stops, so Trent and Mark managed to sneak into the final. Harry Bailey and Ken Hunting had the Irvine working near to its best in the Galaxie and a first round 3.04.04 let the other teams know they had better get serious. The West Aussies, Ian Thompson and Steve Walton had a very nicely built racer with a good turn of speed. After a sorting out session in the first round, a smart 3.08.94 was written into CD Graeme Wilson’s scorebook. It was a good time, but it was still a couple of seconds west of the top three. John Hallowell and Murray Wilson arrived full of promise after finding some amazing speed in practice leading up to the Nats. However, Murphy was about and selected the magenta Rocket as his target. Fuel feed issues saw a big drop in performance and a very slow time. It will be a challenge to make amends in the upcoming Sth Oz and Vic. State Champs. Then it will be surely be ‘game on’. Last year’s winner and reigning Nats Classic B champ Mark Ellins has Poshy doing the pit work for him. The ‘Mighty Marks’ team had some issues in round one, but got it together in the second round to record a 3.10.56. Not quite quick enough as they needed to better 3.06 to make the final. As is now the usual tradition, Classic B times were really close. Apart from Ric and Paul’s sub 3minutes, the other teams had times of 3.04. 3.06. 3.07, 3.08, 3.10 and 3.19. The final was always going to be a beauty and did not disappoint. The flying was clean and the pit stops were quick. All models had good airspeed. In the end it was Ric and Paul home first in a new 140 lap record time of 5.45.78. The Dalesman and OS FX combination saw Trent and Mark post a PB final time of 5.51.91. Harry and Ken were not on 50 lap range with the Irvine and needed an extra stop for their 6.19.34. It is safe to say that this final was the fastest ever Classic B final when all the times are added together. Congratulations to the winners on a fine performance. Vintage A at the Nationals was run for the 24th consecutive time, this year on the lush surface of Alexandra Park. This 67th Nats competition attracted 10 teams, the same number as the demonstration event of 27 Diesel Goodyear. What that means is open to interpretation. Weather was the usual warm 30c and winds were just strong enough to know which side of the circle was best for takeoff. As expected, all competitors were using Rothwell R250’s swinging APC 7×7’s except for Harry Bailey who used a higher revving Graupner 7×7. Harry Bailey and Ken Hunting emerged as the only serious challenger with a hot second round 3.18.56. However, the Macca Racing team of Trent and Mark McDermott were not far behind with a second round 3.20.16 in the last heat of the day. That’s called performing when it counts! The above three teams became the finalists and the others were left to ponder what went wrong and plan ahead for their 2014 State Champs. Among those were Murray Wilson and Neil Baker. Murray’s model is clearly the fastest in the country when it’s on song, although Murray will be the first to admit the perfect run was somewhat elusive at this Albury Nats. Was great to see a couple of West Aussie teams in the mix. Colin and Shane Leknys flew well put in two consistent times in the low to mid 3.30’s. The ‘combateer’ team of the Bellis brothers, Richard and Bruce, did really well in the second round to post a 3.27.06. Andy Kerr and Richard Justic had a best time in the second round of 3.40.81, strangely off the pace for this multi talented duo. The same can be said for 2012 World Champs F2C finalists ‘SuperMarks’ Ellins and Poschkens. A best of 3.41.25 in the first round is light years away from a potential best time. The 160 lap final was good to watch with favourites Fitz and Paul showing a clean pair of heels to Harry, Ken and the Maccas. Apart from a hiccup and tumble at the first stop, Fitzy and Paul then put on a clinic with smooth landings and spotless catching. Their dominant display stopped the lap counter’s watch on 6.48.78. Harry and Ken finished on 7.03.72 while the Maccas went lean in the last part of the race, causing the R250 to cut on takeoff. They eventually completed the race in 7.38.84. At the end of the day, it was yet another very successful Nationals Vintage A competition. The weather gods were kind at Albury this year with the usual extreme heat holding off during most of the Nats. Light winds were prevalent and this gave us near perfect flying conditions. The inaugural Classic FAI T/R race commenced with 15 traditional styled team racers competing in a Concours d’ Elegance. Professionally judged by former FAI team race winner and stunt flyer Brian Ether and expert control line builder Tony Bonello, all the models were laid out for display on the concrete at the Twin Cities flying site. After some model rearranging where the judges put the best models to the front, and Ooo’s and Ahhh’s from the spectators, Paul Steins beautiful Espadon was the eventual winner. Paul accepted a bottle of Australian Sparkling wine as his prize. This was a classy start to the days racing. Thanks to both judges for taking their time to contribute to this first ever Nationals event. There is great engine rivalry between the Parra and Fora engines. Both have had their success. This time the Parra engine was to do well, taking the first 4 places. Eventual winners John Hallowell and Richard Justic have a particularly good Parra. This example is easy to tune and will hold a setting through any hard race or final. Combined with John’s reliable and nicely finished Tiger design, this team was going to be hard to beat. On .012 lines last year, a heat time of around 4.20 was on the pace. These times were achieved with Foras. The Parra is now matching those heat times on the larger.015 lines. Times of note at the Albury Nats were fastest time of the day by Hallowell/Justic on 4.19.10 closely followed by Fitzgerald/Stein on 4.19.68. Paul is using a ABC version of the Parra engine. Hot on their heels was Harry Bailey and Ken Hunting on 4.20.41. This was using Harry’s new Klotznurski model with AAC Parra power. Harry said after the racing that he would probably have to fit an exhaust primer. The compression seal on these motors is not as good as it could be. This combined with a very narrow sealing band around the piston is not conducive to good restarts, especially when hot. The next best time of 4.25 was young Murray Wilson teamed with the Whyalla Wanderer Mark “Poshie” Poschkens. Any time these two enter the circle you know you are in for a real team race. Their 3rd place in F2C at the last World Champs clearly shows that. The remaining teams including Mark and myself, the Macca’s from Ipswich, Leknys/Leknys and Thompson/Walton from Perth, all had equipment problems and will have to lift their game to earn a place in the finals at future major competitions. The final itself was terrific with 3 very competent teams with good equipment going as hard as they could for 1st place at the National Championships. All were away quickly. Model speeds for the 3 teams were about the same. After the first couple of stops Hallowell/Justic were slightly ahead because of better restarts. Paul’s Parra was getting hot causing an extra stop. Ken Hunting had to prime Harry’s Parra manually to get reliable starts. Meanwhile, John and Richard were pulling ahead helped by superior stops. At the 200 lap mark it was Hallowell/Justic first in 8.47.06, second Fitzgerald/Stein 9.11.41 and just 1 second away in third were Harry and Ken on 9.12.50. It was definitely at great final, fitting for this very first Nats Classic FAI Team Race.